Jahana Hayes is a Waterbury Connecticut activist. Shortly after the 2018 election Jahana Hayes joined the Congressional Progressive Caucus. 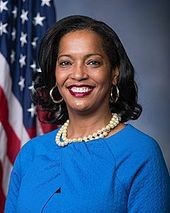 Jahana Hayes, a former National Teacher of the Year, won the Democratic nomination on August 2018 to replace retiring Rep. Elizabeth Esty (D-Conn.), defeating a party-backed candidate. The Associated Press called the race with 44 percent of precincts in Connecticut's 5th District reporting. At the time Hayes was declared the winner, she had 59 percent of the vote compared to opponent Mary Glassman, who had been endorsed by the Connecticut Democratic Party. Hayes, a first-time candidate and former high school social studies teacher, was honored in 2016 by former President Obama at the White House, where she received the National Teacher of the Year Award. Her retirement cleared the way for a Democratic primary in Esty’s district. Glassman, who has worked in various roles at the state government level, immediately jumped into the race. Meanwhile, Hayes — encouraged to run by Sen. Chris Murphy (D-Conn.) — entered the contest in May. Hayes missed out on the state party’s endorsement at its May 14 convention. But she picked up the backing of Sen. Kamala Harris (D-Calif.), a Democratic heavyweight and rumored 2020 presidential contender, as well as the Congressional Black Caucus PAC and the Congressional Progressive Caucus. Jahana Hayes , who won two enthusiastic standing ovations at the state AFL-CIO convention, is an 11-year NEA member after first, as an African-American single mother, gaining a job at the Southbury Training School and joining SEIU Hospital and Health Care Workers 1199. She says her union jobs lifted her out of poverty. As a result, Hayes has an enormous list of unions and progressive organizations in her corner. They include the NEA, its Connecticut affiliate, the Teachers (AFT), AFSCME Council 4, Auto Workers District 9A, Teamsters Local 67, the Service Employees, and the Working Families Party. Glassman had Our Revolution and, narrowly, the state Democratic Party. She beat Hayes on the second ballot at the state convention. Rep. Jahana Hayes, D-Conn., a first-year lawmaker, union member and former National Teacher of the Year made single-payer a key campaign plank in her win in the Danbury-Waterbury 5th District in 2018. Dear MoveOn, Last week MoveOn members made a qualitative difference in the Waterbury office of Jahana Hayes for Congress. Now comes the real test. Tuesday, November 6th, is Election Day!, We need an All-Out Call/Text to all members in Connecticut. I was born and raised in Waterbury. I well know the difficultes running for elected office in the Naugatuck Valley. The large shops and many unions are gone. People are trying to piece their lives together by working in the service industries and can’t well support a family that way. With desperation also comes confusion. They have been preyed on by corrupt politicians who convince them to vote against their interests. Jahana Hayes is a breath of fresh air. The opposite of the millionaire clubs in Congress, she is a working teacher. In fact she is working while running for Congress! She has a chance to be the first African American woman to go to Congress from Ct. She is fighting for green jobs, extending medicare to all and for real gun control. It will only happen if we, MoveOn, get behind this campaign in a big way. This work involves phone calling from the office. We will be identifying people who need a ride to the polls. We have plenty of drivers already so this work is simply calling from the office to ID who needs a ride Go to the Jahana Hayes Office, 11 AM, Tuesday , Nov. 6th at 142 Bank Street, Waterbury, Ct. Let’s keep Ct blue and be apart of this historic victory!!! One doesn’t often meet a candidate for Congress whose platform states support for passive recreation. Yet Jahana Hayes is that kind of candidate. As a mom and a public school teacher, she knows the grassroots needs of communities. While supportive of active reaction as well, she knows there are the majorities of young people who need the alternatives that passive recreation affords e.g. nature walks, writing, poetry, wildlife photography, bird watching, outdoor theater, plein air painting and conservation activities. Please support Democrat Jahana Hayes for Congress on Tuesday, Nov. 6. National attention has also been focused on Jahana Hayes, union teacher and candidate for an open seat in the 5th District who, if elected, will be the first African American woman to go to Congress from this state. “People too will have to stay active and engaged and make sure not go dormant and silent after the election, so we can have your back at the state and local level,” she added. Gary Winfield July 10 2018. With Alicia Hernandez Strong, Maria Horn, Dita Bhargava and Jahana Hayes. Attending Working FP Rally for Jahana Hayes! with Lindsay Farrell, Lori Pelletier and Eva Bermudez Zimmerman. Jahana Hayes February 1 2019. Jahana Hayes with Camila Bortolleto and Carolina Bortolleto. And remember to vote for our CTWFP endorsed candidates! HD 3 - Gannon Long for State Rep.
We're proud to continue supporting Jahana Hayes in her inspiring race for Congress in the 5th Congressional District. Jahana is helping move Connecticut and the nation forward by championing big, smart ideas like #Medicare4All. U.S. Rep.-elect Jahana Hayes, hired a former Chris Murphy aide as her chief of staff. Joe Dunn, a graduate of George Washington University, began working for then-Rep. Murphy in 2010 as his legislative director. Hayes also hired two other key staffers—Veronica DeLandro as district director and Jason Newton as communications director.